[Supv. 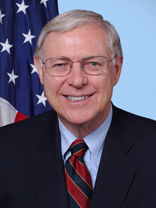 Mike Antonovich] – A motion by Supervisor Michael D. Antonovich seeks to upgrade and expand Los Angeles County’s information and communication technologies infrastructure to spur innovation, job creation, and improved government services. Last week, at the World Economic Forum’s Annual Meeting of New Champions in Tianjin, China, where Antonovich was a panelist, the central theme was “hyperconnectivity” — the trend towards having more of the world’s population online at any given time. As more and more devices from computers to smart phones to kitchen gadgets now have internet capabilities, business leaders are embracing “hyperconnectivity” to put them in direct contact with consumers. Information and communication technologies (ICT) has evolved into a key enabling infrastructure across industries while proving to be a powerful driver of enhanced living conditions and opportunities around the globe. ICT has changed the world dramatically over the last decade or so, and it is bound to continue to do so at an even higher rate going forward. “Just as we invest in our civil infrastructure to move goods and people, we must invest in our digital infrastructure to allow for the movement of ideas and information to enhance innovation and create the jobs of tomorrow,” said Supervisor Antonovich. Chattanooga, Tennessee is one of several cities participating in the US IGNITE program, a joint venture between the National Science Foundation and the White House, to bring ultra-high-speed broadband internet access to 25 cities nationwide. As a result of its $220 million investment in broadband internet access, Chattanooga has attracted dozens of companies including Volkswagen and Amazon – creating over 7,500 jobs and over $2 billion dollars of investment in the region. Antonovich’s motion directs the CEO to coordinate a possible partnership with the County’s Chief Information Office, its 134 unincorporated communities and 88 cites, internet service providers, utility companies, educational institutions, US IGNITE and the economic development agencies in Los Angeles County. The CEO’s office will report back to the Board in 45 days with its findings.